These chicken fajitas get their flavor from a marinade that features cilantro, jalapeno, onions and spices. Served with slow cooked Charro beans, a new mild roasted green salsa and tortillas of course! 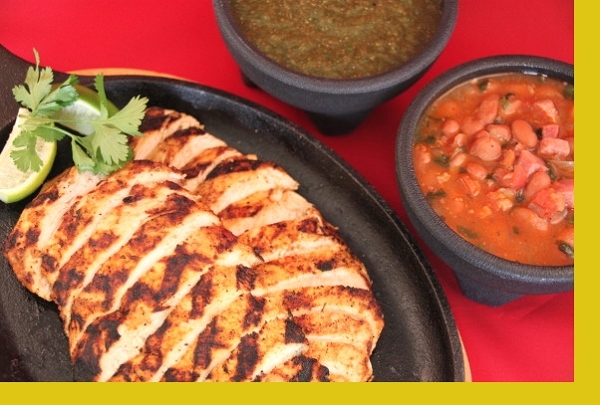 Go from grill to kitchen table in under 15 minutes, then fill your tortillas with loads of juicy chicken, charro beans and top with the our fresh roasted salsa. It's sure to bring out the YUM in everyone! Chicken breast, ham, beans, onion, tomato, cilantro, jalapeno & poblano peppers, lemon juice, oil, spices. 1. Preheat grill. 2. Grill chicken about 6 minutes per side until cooked through. 3. Slice across the length of the Chicken. 5. Reheat the beans and serve with salsa and tortillas. The chicken was tender and seasoned well. The sauce was tasty and the beans were seasoned well. Just because they were fajitas I would have liked some rice but no bigie. Prep was quick and very easy. I love fajitas in general. But one has to try the chicken fajita prepared by Maria. What a difference homemade sauce makes! So well spiced these chicken fajitas make a perfect dinner. Light and tasty. Maria is very generous with the portions. We always have left over for next day's lunch! 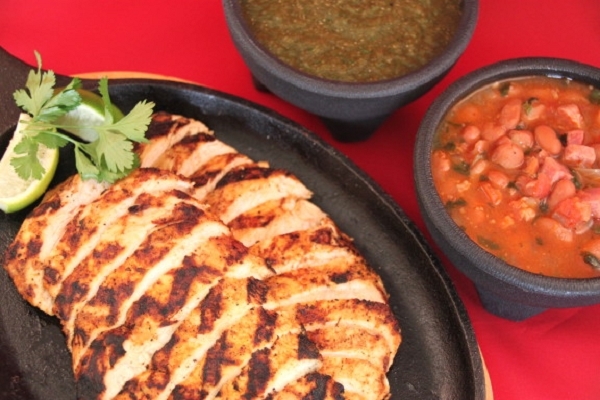 We loved the flavors of the chicken, beans and salsa! It is so nice to have the chicken already marinated so all you have to do is grill it (I cooked mine in my cast iron), slice it and eat it! Having tried the beef fajitas I decided not to use the tortillas so I cooked the chicken, cut it into bite size pieces & combined the chicken with the beans. The beans were delicious with the bits of ham & hamburger & spices used. It made a good one dish dinner.